writings on landscape gardening (she preferred this nomenclature over “landscape architecture”) in Garden and Forest: A Journal of Horticulture, Landscape Art, and Forestry (1888–1897) have received scant attention. Most important, she is unacknowledged as the author of over 330 of the journal’s editorials and other unsigned articles. Only a small percentage of these writings, retitled and revised, were included in Art Out-of-Doors: Hints on Good Taste in Gardening (1893). This book seeks to establish Van Rensselaer as one of the most significant figures of late-nineteenth-century landscape architecture. Van Rensselaer’s particular gift, according to Major, was her perception of landscape gardening as something intimately connected to and indivisible from the arts of painting, sculpture, and architecture. Major is successful and thorough in giving us the personal background on Van Rensselaer that we need to understand the contributions of this widely-accomplished woman. During her childhood, her parents’ Fifth Avenue address placed the Griswolds in the world of Astors and Vanderbilts. Architectural historians will be pleased to learn that Richard Morris Hunt designed the classic Stick Style residence of Marina’s uncle J. N. A. Griswold in Newport in 1864. She passed her adolescence primarily in Europe, receiving an informal education through reading and travel. We learn about the people that she met and, more importantly, the books she read and their impact on the formation of her mind and taste. Unlike so many of her countrymen, she did not admire the works of John Ruskin, whom she frequently criticized in her later writing. On the other hand, she was drawn to the books of Matthew Arnold, especially his Literature and Dogma (1873). More importantly, she read and praised Charles Darwin and Alexander von Humboldt, gaining for her later criticism a sophisticated base in the scientific analysis of the natural environment. At age twenty-one, Mariana married Schuyler Van Rensselaer, who was descended from an old and distinguished New York family, and the couple returned to the United States. Van Rensselaer launched her writing career with art criticism for the short-lived journal American Art Review (1879–1881). Subsequently she was published in the most important journals of the age: Century, Harper’s, Scribner’s, the Atlantic, and the North American Review. Her essays treated manners, the changing world of educated women, art, architecture, and landscape, among others. In 1886 Frederick Law Olmsted wrote to express his enthusiasm for her criticism of designed landscapes, ending with “I want to see more.” (25) She was keenly interested in Olmsted’s work, especially Olmsted’s collaborations with his friend and Brookline neighbor, architect Henry Hobson Richardson, whose work she was praising in Century at that time. Those associations led to her most important opportunity in architectural criticism, a monograph on Richardson, written after his premature death in 1886. The supporters of that project were both Olmsted and another Brookline neighbor, Charles Sprague Sargent, director of the Arnold Arboretum. Henry Hobson Richardson and His Works (1888) became the first major monograph on an American architect and the foundation for all later scholarship on Richardson. Because Van Rensselaer had written on both architects and landscape architects, she had the right sympathies for the project, although she reported being glad that she did not know Richardson better so she could remain objective. The involvement of Sargent in this project led to the most important long-term writing opportunity of Van Rensselaer’s prolific career, the editorials and articles that she contributed to Garden and Forest during its single decade of existence. Major’s decade-long engagement with Van Rensselaer’s writings in the journal permits her to analyze them in detail. She intertwines a chronology of her subject’s life, including the tragic deaths of her husband, son, and sister, and describes her travels, especially the places where she chose to spend her summers. Thus we are able to learn much about the woman, which helps us to understand the nature and intentions of her criticism at various points in time. It is regretted that no general account of either the breadth or the depth of the subject described by its title is to be found in the book. Its various chapters deal lightly and pleasantly with such special problems as the grouping of trees and shrubs, the attachment of houses to their sites, roads and paths, formal gardens, piazzas, and so on; the pleas of the book being that all such problems should be solved in an “artistic spirit.” The advice offered is well put, and the book should have a multitude of readers. Our only fear is lest the author has inadequately warned these readers of the facts, that good “art out-of-doors” must be founded in rationality, purpose, fitness; and that its field is not only the garden, the shrubbery, and the park, but also the village, the factory, and the railroad yard. According to this book, landscape architecture is much like house-furnishing: a selecting of agreeably harmonizing elements in the shape of buildings, rocks, trees, climbing-plants, and so on. The essentially virile and practical nature of the art and profession is ignored, together with most of its greater and more democratic problems. But when this has been said and allowances made, the book remains the best book in its field that we have had in many a day. Its style is exceedingly good, and its tone puts it above comparison with the books of the horticulturalists which are its only contemporary rivals for the public ear. As Major reports, the French landscape architect Edouard André also found the potential impact of Van Rensselaer’s writing to be limited because it was too “high-class.” Nevertheless, Frederick Law Olmsted Jr. and Arthur Shurcliff, who were early professors of landscape architecture in the program they organized at Harvard beginning in 1900, included the book as a required text, as did other academics of the early twentieth century. 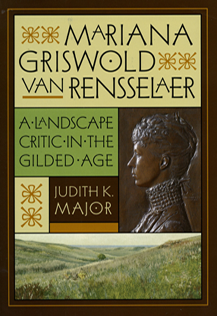 Major’s earlier work on Andrew Jackson Downing, who could be seen as the first critic of the American landscape, landscape gardening, and horticulture, gives her a unique perspective on Van Rensselaer. Somewhat like Downing, Van Rensselaer saw landscape gardeners as artists. She began her contributions to Garden and Forest with the seven-part series in which she defined the nature of landscape gardening, somewhat as she had done previously for the journal American Architect. One of the most important contributions of this book is Major’s careful unpacking of these seven essays and their backstories. Another great pleasure of this text is the illustrations, which include many that have not been published previously or at least recently. Major has made an exemplary effort to provide visuals for places and people mentioned in the text. There is also a substantial corpus of images of the author at various stages of her life. Both Major and the University of Virginia Press are to be commended for having included a bibliography, an element that is sadly being eliminated from many scholarly publications for financial reasons. Keith Morgan is director of architectural studies at Boston University. His recent publications include Community by Design: The Olmsted Office and the Development of Brookline, Massachusetts; Buildings of Massachusetts: Metropolitan Boston, for which he served as editor and lead author; and a new introduction for the republication of Charles Eliot, Landscape Architect.